Before launching Amazon Business, we met with procurement leaders who talked about how much time their teams spent managing the pricing contracts of their suppliers. The more progressive procurement leaders questioned the value of this activity for some of their suppliers. They asked if there was a way to offer employees a marketplace experience that gave them the ability to compare products and sellers before making a purchasing decision. An integration with Amazon Business gives businesses the best of both worlds — integrated access to millions of products while leveraging established approval workflows within their e-procurement systems. Most e-procurement systems support punchout — a software application that allows users to access and shop in a supplier’s online catalog from within their e-procurement system. The typical punchout integration process requires the supplier’s technical resource to generate and provide credentials to the business to set up the integration. The business also has to assign technical resources to set up and test the integration. Amazon Business simplified the integration process by offering businesses an intuitive self-service experience. We implemented logic in our backend systems that automates the generation of punchout credentials, eliminating the need for businesses to contact us for credentials. Businesses can now configure, test and go live with their punchout connection without involving technical resources. Punchout integrations that previously took a few months can now be completed in a few hours. 1. 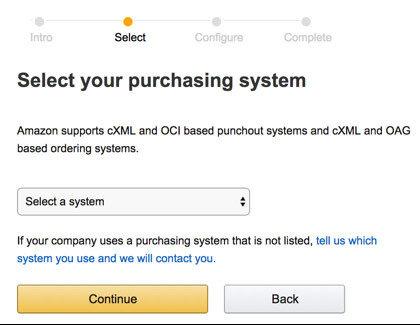 While on your Amazon Business account, navigate to “Systems Integrations” from within your “Business Settings” and click “Configure Purchasing System” to generate your punchout and ordering credentials. 2. Follow the prompts and select your e-procurement system from a dropdown list of over 90 purchasing systems. 3. 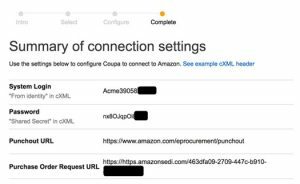 Now that you have generated your credentials (see sample below), log in to your e-procurement system to configure Amazon Business as a punchout supplier. The punchout credentials are set to “test mode” by default so you can immediately start testing the punchout and send test orders. Another way we simplified the punchout integration was to eliminate the need for a traditional test environment. No longer will you need to maintain a separate set of credentials for your test and production environments. Here is how it works. While your punchout credentials are in test mode, we will treat your orders as test transactions that will not ship. You will then receive an order confirmation email for your test orders, giving you real-time feedback on your test results. Once you are done testing, add a payment method to your group, switch your credentials from “test” to “active mode,” and start sending production orders. Here's how to switch your punchout credentials from test to active. 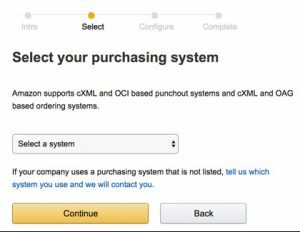 Now that we have covered how we simplified integrations, let’s highlight a couple of key features that enhance the punchout experience on Amazon Business. Employees are used to a personalized experience when shopping at home on B2C sites, so why can’t they experience the same benefits at work when shopping on B2B sites? When we talked with businesses, it was clear they wanted a personalized shopping experience on the Amazon Business punchout. A typical punchout catalog does not differentiate between users accessing the site. This means all users will get the same shopping experience without any personalization. Amazon Business, on the other hand, is able to offer a personalized shopping experience because each punchout user has their own individual business-user account. Here is how it works. When a user punches out to Amazon Business for the first time, we will recognize the email address passed by their e-procurement system. The user will then go through a one-time process to create their own individual business-user account. The next time the user punches out to Amazon Business, we will recognize the user and offer them a personalized shopping experience. (Refer to the previous articles in this series “Achieving a Personalized Buying Experience for Businesses” and “Shop as if a Procurement Professional is Sitting Next to You” for more details). When we built support for punchout, one of our key principles was to give punchout users the same shopping experience as users accessing Amazon Business directly. For this reason, we launched Enhanced Checkout, a feature that gives users the ability to select shipping speeds, schedule delivery for large, bulky items, and apply promotional codes to their punchout cart. Enhanced Checkout also gives the user an estimate on shipping costs and taxes based on their “ship to” address. We are able to read the “ship to” address sent from the user’s e-procurement system during punchout, or the “ship to” address the user selects on Amazon Business. That way the user gets a realistic estimate of the total cost of the order, and the business can encumber the funds during the requisition approval process. With Enhanced Checkout, punchout users can experience a simple, comprehensive checkout. Click here to learn more about the Enhanced Checkout Experience. This article covers just some of the new ways Amazon Business has made the punchout experience simple, personalized and transparent. In our next article, we’ll dive deeper into how to leverage spend visibility for procurement insights. You can learn more about spend visibility with Amazon Business here. Oloyede Olumide is Amazon Business' head of product integrations.